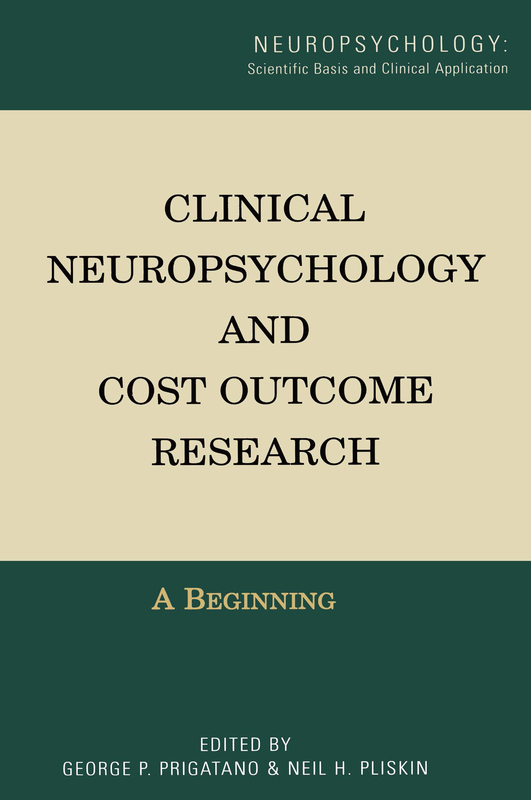 This edited book introduces clinical neuropsychologists to the concepts and challenges involved in conducting cost outcome research. G.P. Prigatano, Healthcare Economics and Neuropsychology. G.P. Prigatano, L.Y. Zigler, L.D. Rosenstein, The Clinical Neuropsychological Examination: Scope, Cost, and Healthcare Value. M. Sherer, T.A. Novack, Neuropsychological Assessment After Traumatic Brain Injury in Adults. R.M. Ruff, P.M. Richards, Neuropsychological Assessment and Management of Patients with Persistent Postconcussional Disorders. P.S. Complair, R.W. Butler, M.D. Lezak, Providing Psychological Services to Families of Brain Injured Adults and Children in the Present Healthcare Environment. N.H. Pliskin, L.A. Sworowski, Neuropsychological Assessments of Patients with Cerebral Vascular Accidents. J. DeLuca, M.T. Schultheis, Neuropsychological Assessment of Patients who have Undergone Surgical Repair of Anterior Communicating Artery Aneurysms. C.A. Meyers, S.B. Cantor, Neuropsychological Assessment and Treatment of Patients with Malignant Brain Tumors. K.A. Welsh-Bohmer, D.C. Koltai, D.J. Mason, The Clinical Utility of Neuropsychological Evaluation of Patients with Known or Suspected Dementia. D.C. Koltai, D.J. Mason, K.A. Welsh-Bohmer, Neuropsychological Consultation and Training of Family Members of Patients with Dementia. C.B. Dodrill, Neuropsychological Evaluation of Patients with Epilepsy. R. Martin, B. Bell, B. Hermann, S. Mennemeyer, Non-Epileptic Seizures and their Costs: The Role of Neuropsychology. L.A. Humphrey, P. Satz, The Use of Neuropsychological Evaluation in Clarifying the Educational Needs of Children with Learning Disabilities. L. Diller, Y. Ben-Yishay, The Clinical Utility and Cost Effectiveness of Comprehensive (Holistic) Brain Injury Day Treatment Programs. M. Pepping, G.P. Prigatano, Psychotherapy After Brain Injury: Costs and Benefits. B.A. Wilson, J. Evans, Does Cognitive Rehabilitation Work? Clinical and Economic Considerations and Outcome. R.J. Echemendia, M. Lovell, J. Barth, Neuropsychological Assessment of Sports-Related Traumatic Brain Injury. L.L. Thompson, Neuropsychological Assessments of Physicians Whose Competence to Practice Medicine is Questioned. R. Heilbronner, N.H. Pliskin, Clinical Neuropsychology in the Forensic Arena. W.D. Gouvier, P. Lees-Haley, J. Hayes Hammer, The Neuropsychological Examination in the Detection of Malingering in the Forensic Arena: Cost and Benefits. T.M. Kashner, C.M. Cullum, R.I. Naugle, Measuring the Economics of Neuropsychology. G.P. Prigatano, N.H. Pliskin, Postscript: Reflections and Future Directions.